Audiologists. Will You Join Us? 03 Dec Audiologists. Will You Join Us? The Hearing Aid Project takes donations of used hearing aids, refurbishes them, and provides them to those who can’t afford them. When we identify a person in need within your community, we partner with an audiologist like you to perform the fitting. We have plenty of refurbished hearing aids – and plenty of recipients. But we’re in real need of an audiologist to help one or more patients in your community each year! This volunteer opportunity is unique, rewarding and mutually beneficial. You may be wondering ‘how?’ Let’s jump right in, shall we? 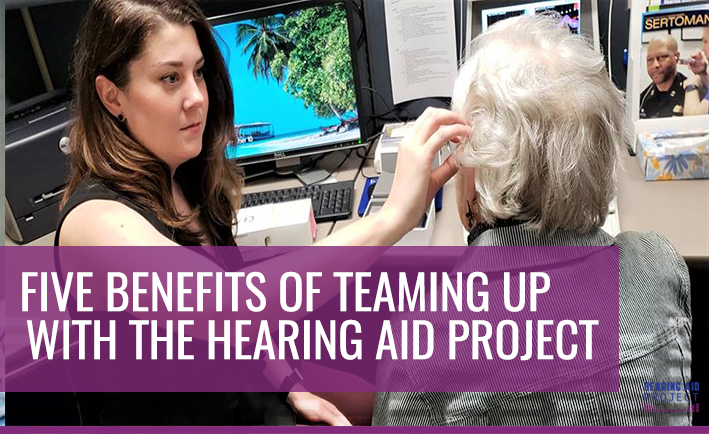 Here are five reasons to get on board with the Hearing Aid Project today! Grow – When you work with our philanthropic program, you can grow, expand and meet new people. We refer patients to you, and these individuals can also become a reference in your community. Building more relationships = growing your practice. Stand Out – By teaming up with the Hearing Aid Project, you can set yourself apart from other audiologists. Think about it this way – let’s pretend you are choosing a new dentist, and the only difference between dentist #1 and dentist #2 is that dentist #2 helps more people in the community. Who would you pick? Dentist #2, right? Be that person! Make Your Own Schedule – With the Hearing Aid Project, you can volunteer on your own time. You can help one patient, five patients, 10 patients, etc. Not all of your work is expected to be pro bono either. We are willing to work with you so that both you and our recipients are taken care. Create a Permanent Footprint – As an individual who is passionate about hearing health, you have the power to inspire, educate and engage your community. Be a community-driven leader and lead by example. Let your mark on the world be helping others through your craft. Make a Difference – Is there a better feeling than helping someone in need? Imagine putting hearing aids on someone who thought they could never have them. Our refurbished hearing aids, combined with your services, will change a life forever. The world needs more good. Together, we can create more good. Does that sound good? If you are ready to get on board, or still have questions, we are here to help every step of the way. Send us an email at info@hearingcharities.org to get started. We can’t wait for you to join us!